Etel Adnan was born today, February 24, in 1925 in Beirut, Lebanon. She is a Lebanese-American poet, essayist, and visual artist. In 2003, Adnan was named "arguably the most celebrated and accomplished Arab American author writing today" by the academic journal MELUS: Multi-Ethnic Literature of the United States. Besides her literary output, Adnan continues to produce visual works in a variety of media, such as oil paintings, films and tapestries, which have been exhibited at galleries across the world. Adnan's mother was a Christian Greek from Smyrna and her father was Muslim Syrian and a petty officer. 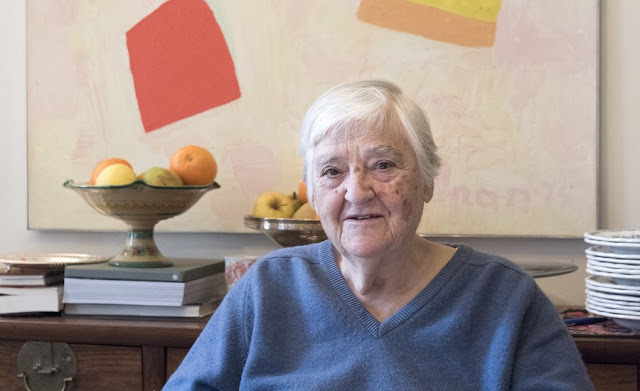 Though she grew up speaking Greek and Turkish in a primarily Arabic-speaking society, she was educated at French convent schools and French became the language in which her early work was first written. She also studied English in her youth, and most of her later work has been first written in this language. At 24, Adnan traveled to Paris where she received a degree in philosophy from the Sorbonne. She then traveled to the United States where she continued graduate studies at the University of California, Berkeley and at Harvard University. From 1952 to 1978, she taught philosophy of art at the Dominican University of California in San Rafael. She has also lectured at many universities throughout the United States. Adnan returned from the US to Lebanon and worked as a journalist and cultural editor for Al-Safa, a French-language newspaper in Beirut. In addition, she also helped build the cultural section of the newspaper, occasionally contributing cartoons and illustrations. Her tenure at Al-Safa was most notable for her front-page editorials, commenting on the important political issues of the day. In her later years, Adnan began to openly identify as lesbian. Adnan also works as a painter, her earliest abstract works were created using a palette knife to apply oil paint onto the canvas – often directly from the tube – in firm swipes across the picture's surface. The focus of the compositions often being a red square, she remains interested in the "immediate beauty of colour". In 2012, a series of the artist's brightly colored abstract paintings were exhibited as a part of documenta 13 in Kassel, Germany. Inspired by Japanese leporellos, Adnan also paints landscapes on to foldable screens that can be "extended in space like free-standing drawings". In 2014, a collection of the artist's paintings and tapestries were exhibited as a part of the Whitney Biennial at the Whitney Museum of American Art. 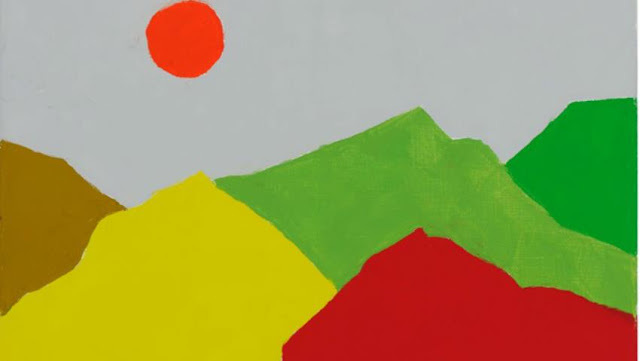 Etel Adnan's retrospective at Mathaf: Arab Museum of Modern Art in Doha, titled "Etel Adnan In All Her Dimensions" and curated by Hans Ulrich Obrist, featured 11 dimensions of Adnan's practice. It included her early works, her literature, her carpets, and other. The show was launched in March 2014, accompanied by a 580-page catalog of her work published jointly by Mathaf and Skira. The catalog was designed by artist Ala Younis in Arabic and English, and included text contributions by Simone Fattal, Daniel Birnbaum, Kaelen Wilson-Goldie, as well as six interviews with Hans-Ulrich Obrist. She currently lives in Paris and Sausalito, California.